Dubai, UAE, July 18, 2018: The Venice International Film Festival is the occasion for Jaeger-LeCoultre to present its two new models from the Joaillerie 101 collection in pink gold. A starring turn that is sure to turn heads. The name Joaillerie 101 is particularly evocative for women. A never-ending story, one where watchmaking expertise meets jewellery perfection. A unique story, dating back to 1929 with the creation of the smallest mechanical movement in the world, entirely made and manufactured at the Grande Maison of the Vallée de Joux. A match made in heaven: Fine Watchmaking and High Jewellery. Ancestral expertise lies hidden under the diamonds of these two original models, holding the secrets of the infinitely small. Available today in pink gold, Joaillerie 101 Reine and Joaillerie 101 Feuille offer women of the world a starring role: heroines by day and by night. Since 1929, the Jaeger-LeCoultre Calibre 101 has stood out in terms of the mastery of absolute miniaturisation. At the time, pocket watches were giving way to wristwatches, which were particularly prized by women who dreamed of wearing a jewel on their wrist that brought together the precision of mechanical operations and a refined aesthetic. This calibre took its inspiration from the famous Duoplan movement, characterised by its division into two horizontal planes, one on top of the other. Now almost one hundred years old, and having benefited from all those years of expertise, it remains the smallest mechanical movement in the world. Contained in a volume of 0.2 cm3 and measuring 14 mm x 4.8 mm, with a thickness of 3.4 mm, each Jaeger-LeCoultre Calibre 101 is unique. Each of its components is custom manufactured and adjusted. Weighing barely a gramme, this micromechanical masterpiece contains 98 components assembled by hand by only a handful of watchmakers, since there are only a rare few who have mastered the painstaking assembly of something so small and precise. As a reminder, its balance wheel oscillates at a frequency of 21,600 vibrations per hour, a remarkable technical challenge in terms of precision. The iconic Jaeger-LeCoultre Calibre 101 has stood the test of time and fashion, always lending itself well to women’s desires, which can sometimes change a little, sometimes a lot, and often passionately. As these two new versions in pink gold can attest. To best reflect the glamorous world of the Venice International Film Festival, Joaillerie 101 Reine and Joaillerie 101 Feuille are each adorned with 110 pavé diamonds, nestled against one another and arranged by hand at the Manufacture’s workshops. On the silvered opaline dial, two discreet Dauphine hands reflect eternal femininity. And could anything better enhance the union of mechanical perfection and 2 jewellery excellence than pink gold? Sensuous, exquisitely feminine, and timeless, this precious metal is perfectly suited to its new starring role. Where Joaillerie 101 Reine is immediately recognisable as regal, Joaillerie 101 Feuille is more mysterious, more secretive. Echoing a leaf's delicacy, its lid, which takes the shape of a headdress, can be raised or closed at will, revealing or concealing the passage of time. Under the curves of its organic lines, adorned with brilliant-cut and baguette-cut diamonds, the dial of the watch is either hidden from the eyes or revealed to the light of day. An enchanting costume for this star of watchmaking mechanisms. Jaeger-LeCoultre has a special connection to the world of film, sharing with it both daring creativity and a respect for tradition. As partner of the 2018 Venice International Film Festival, the Manufacture is once again paying tribute to stars and actresses, but also to all those women who have the gift of transforming the scenes of daily life into unforgettable moments. For their first public appearance since the SIHH, the new pink gold Joaillerie 101 Reine and Joaillerie 101 Feuille models could not have asked for a more beautiful backdrop than Venice. 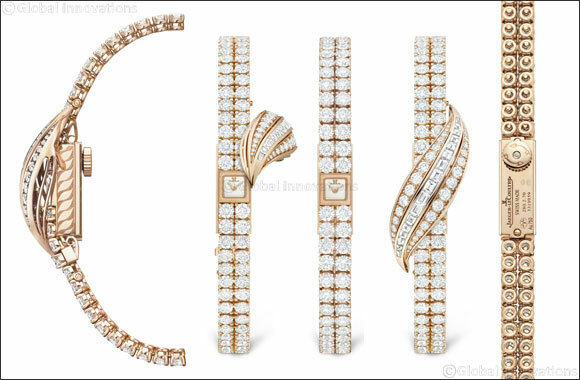 On the red carpet and on the wrist, will it be the watch or the High Jewellery piece that steals the spotlight? At heart, though, there really isn’t a conflict, each blends into the other, forming a partnership that puts sparkles in the eyes of women each day. From the September 14th to 30th, visitors to Homo Faber in Venice will be able to witness some of the incredible skills and techniques mastered by artisans working in the European luxury sector and presented in the exhibit Discovery and Rediscovery. Homo Faber is the first event organized by the Michelangelo Foundation, an international non-profit organization based in Geneva, Switzerland. The event was set up to celebrate and to preserve master craftsmanship and the link to the world of creativity and design. For this occasion, JaegerLeCoultre is proud to present the Calibre 101, symbol of the unique expertise of the watchmakers of the Grande Maison, and smallest mechanical movement in the world since its creation in 1929.